We talked about it and agreed that spending a bit of money here and there about the house to make things feel more like “us” and to raise comfort levels wouldn’t be such a bad idea. We began with the cooker. I really loathed the one that I was using. It isn’t whole-hearted. Not a case of my one true love (that would be anAGA). 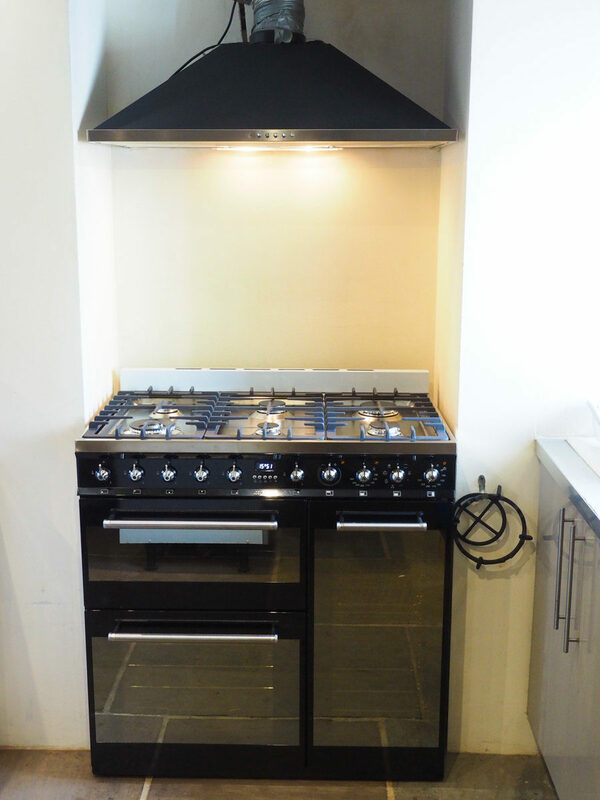 However there is much about it that I really like.and, let’s face it, it is in a far superior league to the last appliance that occupied that space. If we have anything to complain about in living here, it is in the water supply. We quite simply have the hardest water that I have ever encountered and lime scale is a huge issue. The kettle furs up in days. I gave up drinking tea when we came here because the scum that floats on top is very off-putting. When we were back in Yorkshire recently it was good to have a proper cuppa and it left me wishing that I could drink tea at home. Seeing as I came home with a one-person tea pot too, seems silly to have that and not to drink tea! 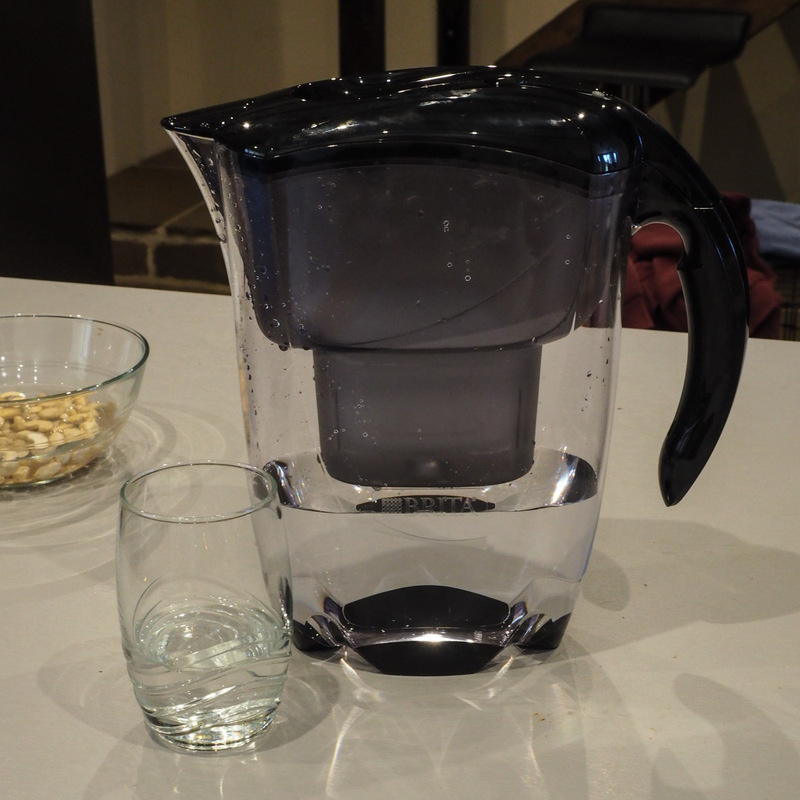 We really need an in-line filter on the water supply but until such time as we get around to that, we now have a new water filter jug. The water that we drink is so much better now. Coffee from the espresso machine is much improved. I haven’t actually had a proper cup of tea yet but am loving the Lipton’s flavoured teas, which come out beautifully clear. Never a huge fan of the vacuum cleaner so don’t imagine that I have been doing a Freddie Mercury about the old homestead. Nooooo. 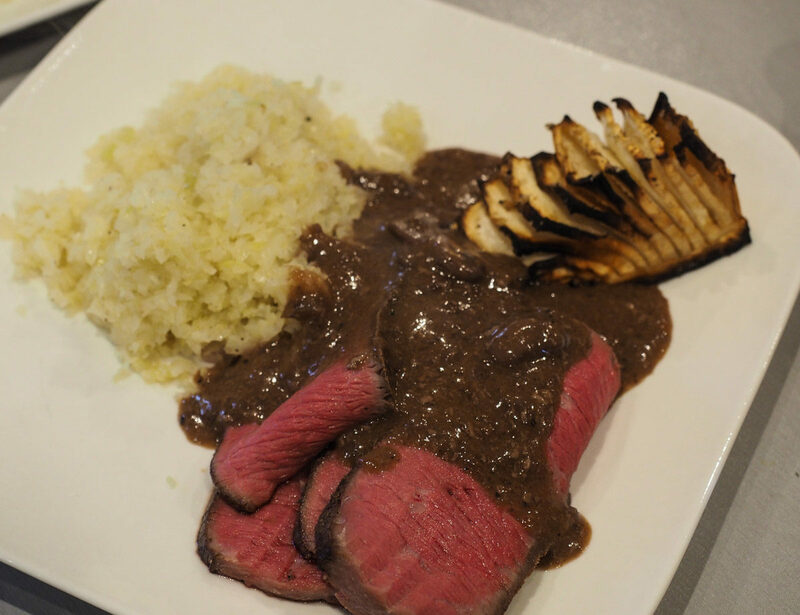 Far more interesting than that, I am satisfying a long-held desire to try out sous-vide cookery. 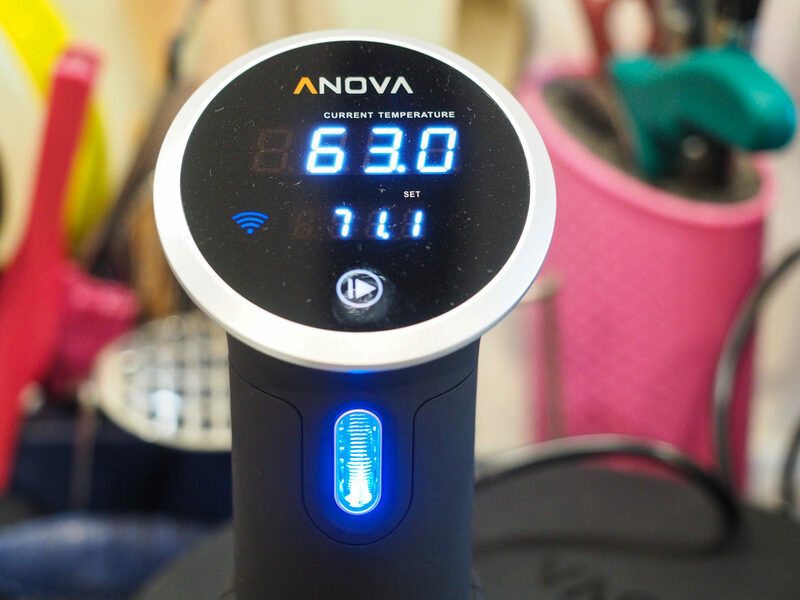 We have invested in an Anova immersion wand. Very whizzy – Bluetooth and wiFi-connected, , ideal for control freaks. Theoretically I can “phone home” and set the dinner cooking, should I wish to. Of course, as with many such gadgets, they do not come alone. The supporting cast features a vacuum-bagging machine (no pic yet), a lovely new heavy-gauge stainless steel stockpot and ditto frying pan. My Non-stick Ingenio pans were suffering from being used at high temperatures and the coating has become a little pitted. To save it from getting worse and to do a better job of searing, I wanted a cast iron pan. Yesterday when we went shopping we were unable to find such a thing, so I settled on the steel one. Yesterday I overbought on the strawberries, forgetting what a small quantity we can eat at present. 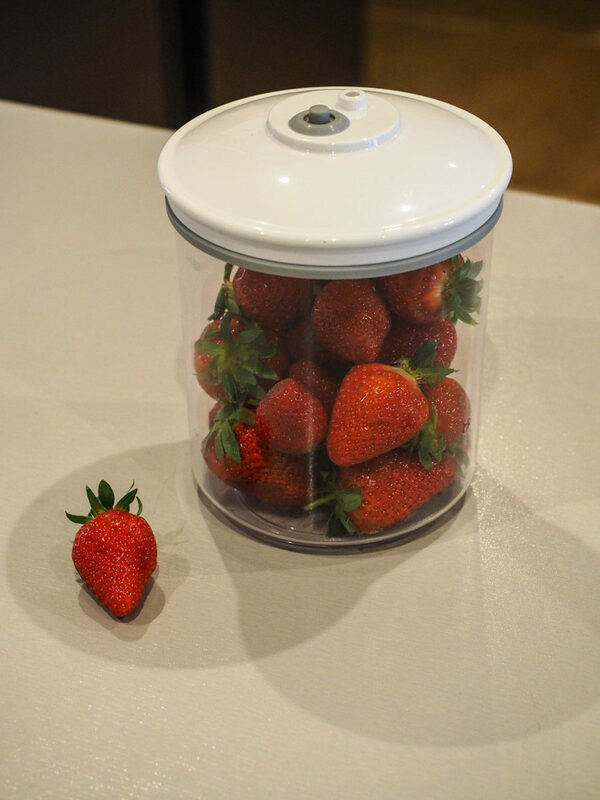 Luckily, the vacuum bagging machine came with a storage pot, ideal for preserving soft fruits. So, all that is fun and adds to creature comforts but it’s not really adding any style to the place, is it or really make it more like our home. In the living room we now have a set of Bluetooth speakers and we have begun a trial of Amazon Music. It definitely feels more like home, with some music playing. I have missed my music so very much. 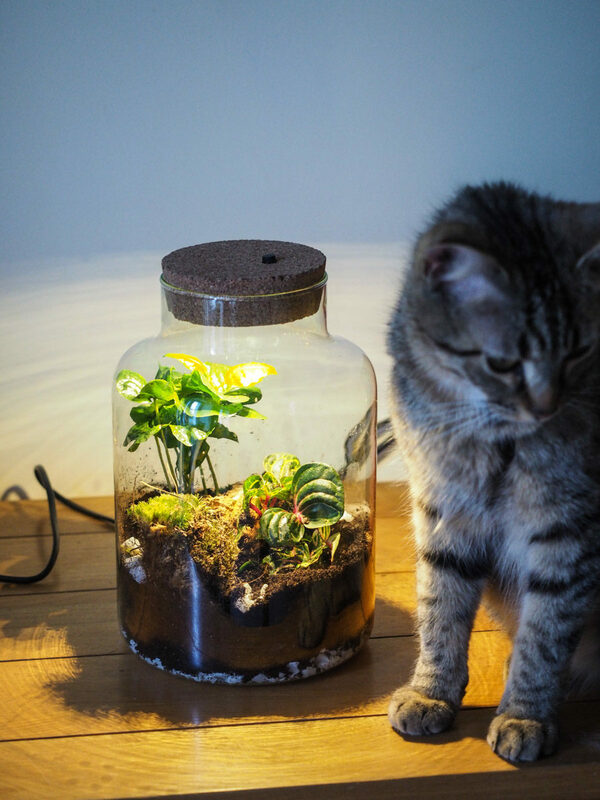 Finally, one touch that certainly is a bit “me” – I purchased a little illuminated terrarium yesterday. So, not getting very far with the home-making yet, am I? This evening I spotted a coffee table on one of the local FB Sales and Wants groups. I am quite taken with it. OK, it’s second-hand again but it’s solid wood, oak, functional and certainly more to my taste than the make-do that we have in place just now. I have shown my interest and await a reply. I remain a little edgy and a tad unsatisfied. I need pictures on the walls, rugs, curtains of my choosing and a few knick knacks about the place. I plan to keep my eyes open as we travel around. I know where there is a table lamp that I desire greatly… it is in Nevers. Actually I have already purchased a very nice lamp base but the people that sold it to me have proved very reluctant and rather rude in not delivering it. I’ll probably Nevers get either one. Ho, ho. Most of all, I need covers making for the three piece suite, which is in a disgusting state as well as being a most sickly and revolting shade of pink (me? PINK? No way), though comfortable. Would it be incredibly tacky to have a photo or two of my own printed up to hang on the walls? I quite like the look of those prints on aluminium. Pricey, I know. And do I have any photos good enough to commit to that course? Hmm… I do quite like the one of the Flag Irises that I took this week.